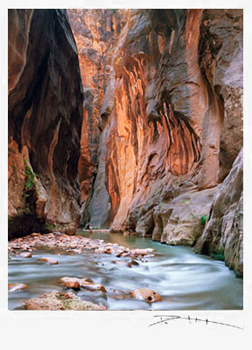 The first time I hiked The Narrows, I knew I wanted an image that captured its awesome features. For six years, I returned regularly until I found the spot I wanted; then I made many more trips to get optimum conditions, which turned out to be a day in July with a five-minute window of near-perfect light. I used a 4X5 view camera and a 135 mm lens with a six-second exposure which captured the movement of the water. 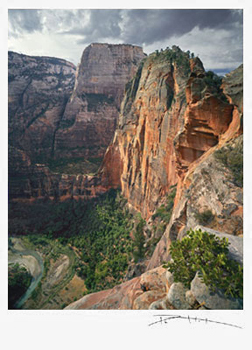 This is a morning shot with the face of Angels Landing in full sun and the Great White Throne brooding in shadows behind it. I wanted to show the sheerness and height of the cliffs, so I perched my field camera precariously close to the edge. I shot a 4X5 view camera with a 75 mm wide-angle lens. 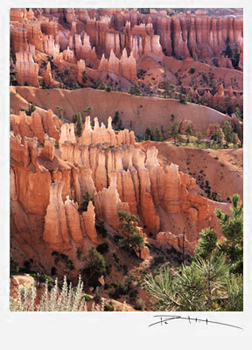 Queens Garden is one of my favorite places in Bryce Canyon National Park. Centuries of weathering have exposed the colorful Claron formation and sculpted fragile spires that have an eerie translucence in certain light. That quality of light was my goal in this morning shot taken with a 4X5 view camera and a 210 mm lens. 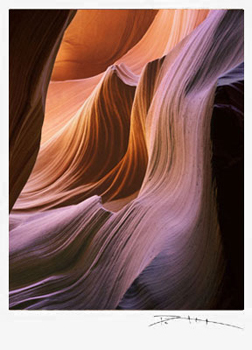 Lighting and design were my essential concerns in Antelope Canyon. I like this canyon for its abstract sensuous qualities so I shot it without sky or canyon floor as reference points for the viewer. I used a 4X5 view camera and a 210 mm lens. 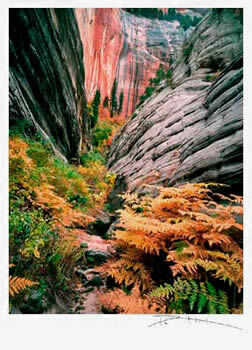 This is a side canyon on the West Rim Trail in Zion National Park. I wanted to capture the interplay between changing fall colors of the ferns in the foreground and the rock formations in the background. 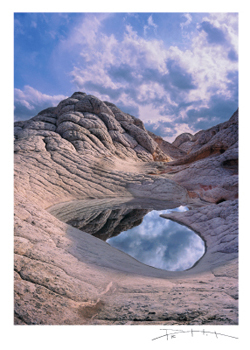 These striking formations are just one aspect of the remarkable Paria Plateau. 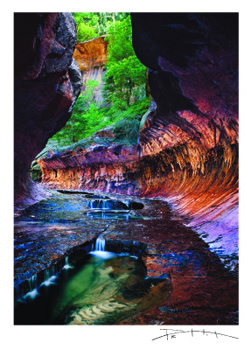 The keyhole slot of the Subway is a favorite stop for hikers in Zion National Park. 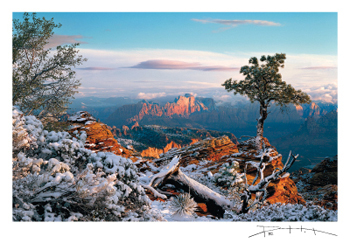 over the snowy canyon below. Canaan Wilderness Study Area, Utah. This was a truly rare moment in May. 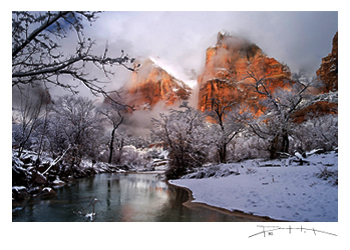 I awoke to a fresh snowfall before sunrise and scrambled to record this glorious morning before the warm spring sun changed the scene. 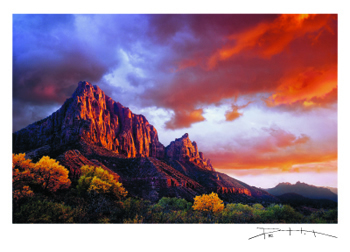 The Watchman dominates the landscape of lower Zion Canyon and the town of Springdale as it glows in Autumn evening light.